This article contains out-of-date information. This article is only a stub - it's far from covering the topic to match the MWLL Wiki standards. The Standard Beam Laser is the most basic energy weapon available in MWLL, allowing units to operate independently of ammunition supplies unlike Ballistic or Missile Weapons. As the name suggests, Standard Beam Lasers fire a laser beam, damaging anything the laser comes into contact with. There is no travel time to the target and the beam can be swept across an area, damaging everything it touches, making it difficult to dodge completely. The beam does deal damage over time, however, meaning that to obtain the full benefit of the weapon's capabilities it needs to be directed at a single target, or better yet a single location on the target, for the duration of its firing time. Another possible pitfall is that Standard Beam Lasers (like all Energy Weapons) generate comparatively large amounts of waste heat. It should be noted however, that Inner Sphere lasers output much less waste heat than their Clan counterparts, though with mildly less damage. The default weapon of any newly spawned Battle Armour, the BA SBL is a surprisingly powerful weapon with a higher damage and rate-of-fire than the SBL. Although there are other, more powerful Battle Armor Weapons the BA SBL can be used against most targets effectively in skilled hands. While the damage is lower than the BA Micro Heavy Laser, the BA SBL is a much quieter weapon, able to be confused with any other small laser when seen on the battlefield. This can give the user much more time without being noticed by hostiles. Primarily short-range weapons, both the SBL and MBL generate a small enough heat load that they can often be fired without worry even in high temperature maps. In addition, their rate-of-fire is fast enough that units mounting several can keep up an almost constant stream of fire when using chain fire. SBL's can be identified by the red color of the laser it fires, while MBL's fire a green laser. Small and medium lasers are easy to underestimate, yet in groups or against already damaged components easily apply damage over time. The relatively low heat load and pinpoint damage is also excellent for dealing with hostile Battle Armor. The heaviest Standard Beam Laser, LBLs have the longest range, deal the most damage, and also generate the most heat. Although it has a slow rate-of-fire it makes an excellent sniping and long-range support weapon. If a unit is firing several LBLs it should keep an eye on its heat levels or risk overheating. While Inner Sphere LBLs do lack some of the damage of their Clan counterparts, they are still not to be underestimated. Additionally, the much lower heat load, combined with the generally heavier armor of Inner Sphere assets can allow for surprising amounts of suppressing fire. The SBL and MBL were both introduced by the Terran Hegemony circa 2300, with the LBL to follow in 2316. This most basic laser technology was so wide spread it managed to survive the Succession Wars, with over 50 different laser models in production by the time of the 4th Succession War. The Medium Beam Laser is widely considered the most efficient weapon when system mass, heat, range, and damage are all taken into account. 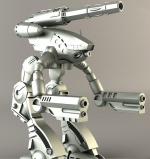 As with Standard AutoCannon, the Clans ultimately phased out Standard Beam Laser technology completely in favor of Pulse Laser and ER Beam Laser designs.